Three years ago we saw a way to open up our professional printing and fulfillment to everyone. 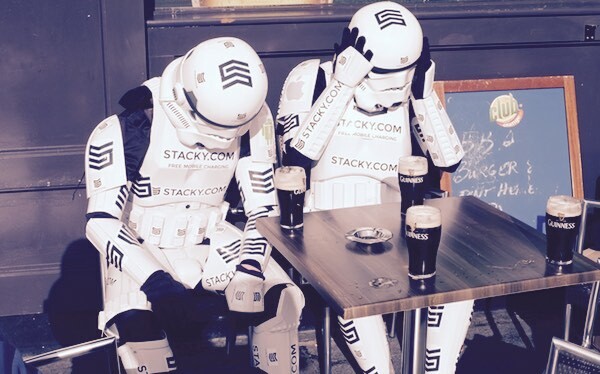 Since then, we've walked the streets of Dublin dressed as STACKY stormtroopers (really), and we've seen you upload lots of amazing art and photography. However, we're a small team and sadly can no longer give STACKY the love it deserves. We have lots of other exciting things in pipeline, and perhaps STACKY will come back brighter in the future, but for now we're closing its doors. If you need your hi-res files, just contact us before January 2016. After this time, your images and all your personal data will be deleted. For enquiries regarding printing your art or photography, visit Prodigi for a much larger range of print products. If you're here to buy art, Magnolia Box contains over 350,000 contemporary and classic images available as prints, canvases or cards. For your images on canvas, the all-new Canvas Republic has a huge range of sizes, rapid delivery and highly competitive pricing. Thanks to everyone who stuck some stuff in their stack.